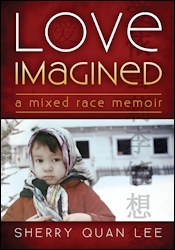 .Love Imagined is an American woman’s unique struggle for identity. Sherry, after 45 years you are still untouched! What a wonderful way to be. I enjoyed your reading. You can be sure of one thing, your dad is Chinese-born. I knew you mother and met much of your family in the late sixties and early seventies. They are living testament to who you are. Continue to “Wonder”, it is a journey I briefly shared with you and which should never end! What’s the deal about “paper” in a book?